Description: NYSW 2064 is on the point of LF-4 at Ridgefield Park, NJ 8/1999. Description: A fall foilage excursion going eastbound over CR 515. Date is approximate. Description: One of the last trains I saw on the NYSW Utica branch had a good set of power, seen as it runs along Chenango County route 32 behind an interesting mix of power. The trailing GE's are former LMX units dead in tow. Description: Across the valley scene of a northbound NYSW train near Greene. The two trailing GE's are former LMX units, and are dead in tow. Description: BH 3 rolls 35 cars across the Chenango River, in a companion piece to the similar photo in this album, only now we see more of the frozen river it is crossing. There was a time when an effort was made to have a yellowjacket leading, to put forth a good image. Not today, as the patch painted ex SP unit is leading. It will eventually become an SD30ECO, but for now, its still a tired ex SP tunnel motor. Description: BH 3 rolls north past Old State Rd, coming down the connector from the D&H. It was built when the Bevier St overpasses were raised about 1990, and the DLW line bridge was removed. The old right of way is seen going off to the right. Description: BH 3 crosses the Chenango River on a cold January day behind a mix of power only a Suskie fan would love. Description: BH 2 rolls north under I 81 as it makes its way toward Chenango Forks and the Syracuse Branch behind a GP 20 that was brought east during the time NYSW ran the TP&W. 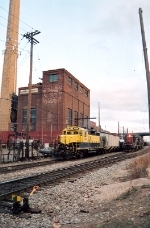 There were three of these units that saw several years of service on the "eastern lines." Also in the mix is one of NYSWs own GP 40s, and a lease fleet ex NW SD 40. Description: When NYSW quit running the TP&W, they brought back several GP 20s. Here one of them rolls north at Old State Rd. Description: This thing came from the RailAmerica TP&W which was sold to the NYS&W and later sold to the G&W as the Tazwell & Peoria. Description: I haven't seen NYS&W power on the lead since CSX started running there four trains along the line!! Description: WS-2 sits in Ridgefield Park after a long day of switching along the line. Description: Idling at the north end of MC Yard on a mild afternoon. Description: SU-99 Power parked next to a local on the main. Description: 2064 pushes a cut into the MC yard for tonight's SU-99 to Binghamton. 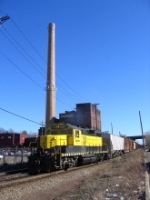 Description: Yea, I like that smokestack. Description: Heading back to the house track after sorting some cars. Description: 2 locos sort cars at the NYS&W's MC yard while CSX Q410 lumbers by on track 2 on the River Line on a 77 degree March afternoon. Description: The six axle ex Cartier units were something less than stunning performers, and the T&E people were not always that fond of them. Someone has expressed his thoughts in the dust on this one, seen outside the Binghamton engine house. Thats one of the ex TP&W GP 20s in the background. Description: Southbound Q433 crawls by as NYSW 2064 prepares tonights SU-99. Title: WS-3(left) and SU-100 power seen just north of Bergen Tpke.